Many people who have laptops have issues with laptops with cracked screens. It can happen in a lot of different ways. Most of the devices are mobile and packed into a bag or a purse. They are left in vehicles and office drawers. They take a lot of abuse. This can create issues with the screen. If you are in Westchester with a laptop cracked screen you may be desperate to get it fixed. The first thing you should do is inspect your laptop. You want to be sure that your screen really is cracked and needs to be replaced. Sometimes it is the graphics card the device uses that fails. An untrained eye may think it’s the screen, when it really is a problem with the inner part of the laptop. 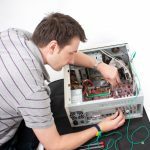 There is no point to proceeding with a replaced screen when it isn’t needed. In the end, if it’s an inner mechanism issue, replacing the screen won’t help you at all. The way to confirm it is not the graphics card is to connect your desktop monitor to the device. If the picture is fine, then it is probably the screen. If you know that recently the device was dropped or something heavy fell on it, then that is another indicator that the screen may need replacement. 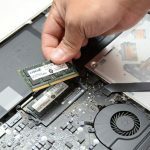 If you have a Westchester laptop cracked screen, you can easily remove it. First, the easiest way to find a replacement screen is to search Amazon, or eBay. Be sure that you look for your laptop’s exact specifications though. You should be able to find the average screen for anywhere from $50 to $85. If you are unsuccessful with searches, try using different numbers on your laptop model. Vendors can use two different types of ID numbers, so test them all out. When it comes to the replacement, first be sure to separate the device from any power—including the battery. Then, use a mini-screwdriver to open the bezel. Use a plastic knife to ease the screen bezel away from the case carefully. Once the bezel is unsnapped, it should be easier to remove with gentle force. The actual LCD screen will be secured to a metal frame on the right and left sides. Remove the screws holding the frame to the screen and then remove the screen. Disconnect the cable for video from the LCD’s back. Remember how you removed the old one and replace it with the new one. Use the screws to secure it. You should be able to line up and push the bezel back into place. Finally, replace the screws that secure your laptop. 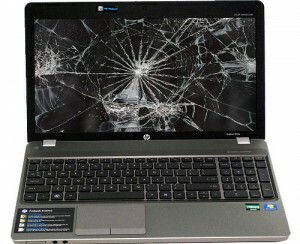 If you have a Westchester laptop with a cracked screen, it is an easier task to replace the screen. It isn’t always easy though. If you have any problems, be sure to take your device to a qualified professional who can do the replacement for you.